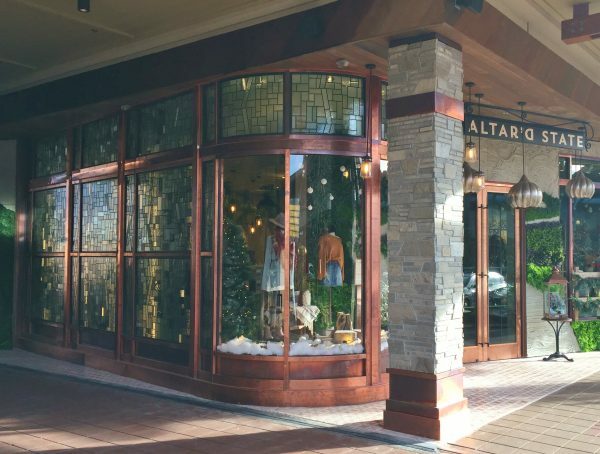 Architects and interior designers who plan for the inclusion of stained glass in commercial projects generally have a vision which encompasses the entire project. For example, great architects such as Charles Rennie Mackintosh of the late 18th and early 19th centuries very rarely designed any sort of building without including some stained glass to allow the occupants and visitors to experience the luxury of gazing upon some spectacularly designed art glass pieces. Scottish Stained Glass loves to work with creative designers and architects to help them bring their visions to life. Scottish Stained Glass has been involved in many such projects including Disney’s Boardwalk Resort in Florida, Central Station Casino and the Gilpin Hotel and Casino in Colorado and countless restaurants and bars. One of our most interesting projects was the Boulderado Hotel stained glass ceiling (see stained glass ceilings) in Boulder Colorado. 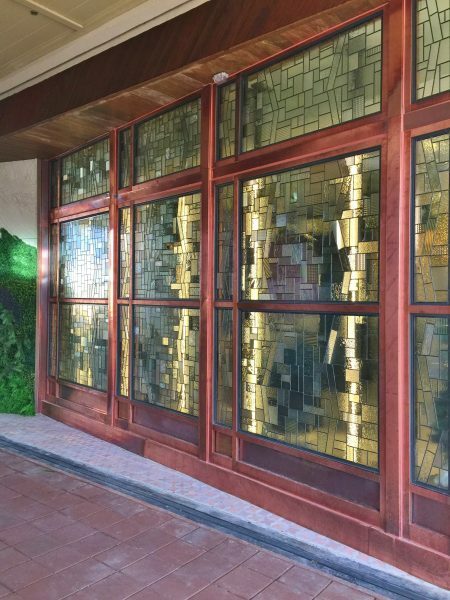 Another was the Art Deco style glass designed by Scottish Stained Glass for the community clubhouse at Anthem Ranch in California. Scottish Stained Glass can add beautiful, custom pieces to your commercial building, no matter what your needs are. 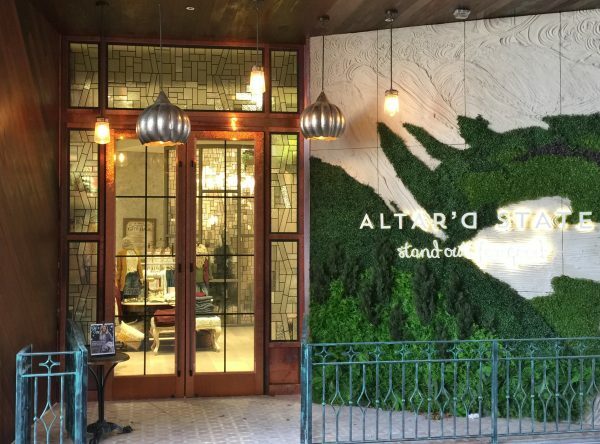 If you are in the process of building, we can help you design a piece of glass that compliments your building designs, and adds the charm that you were hoping for in this new business. 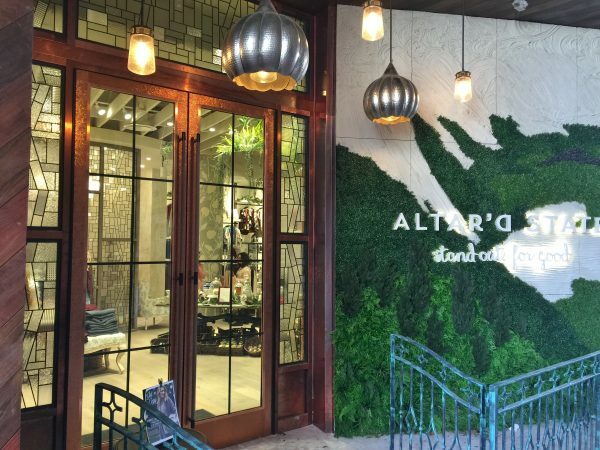 If you are a business owner looking to spruce up your service area, we can add custom stained glass ceilings, signs, panels, and windows in any design that keeps in touch with the style of your business. Our experienced design team will work with you every step of the way to creating a beautiful addition to your business. Adding stained glass is truly like adding a piece of artwork that can be admired in your workplace. When you use colored stained glass window designs in your business, it can become a focal point of any room, and since our glass is the best quality stained glass available, a Scottish piece will represent your business very well. 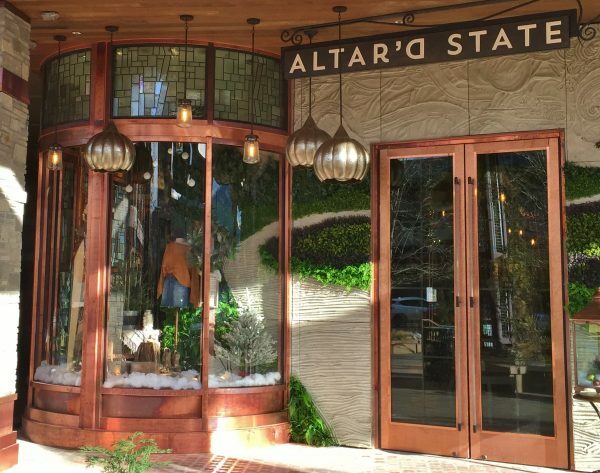 One of our favorite commercial stained glass projects is the leaded storefront and custom leaded partition we created for Altar’d State in Boulder. This contemporary design brightens the location by allowing an abundance of natural sunlight in to showcase their incredible inventory. These eye-catching designs are a great way to attract new customers while promoting a specialized shopping experience. 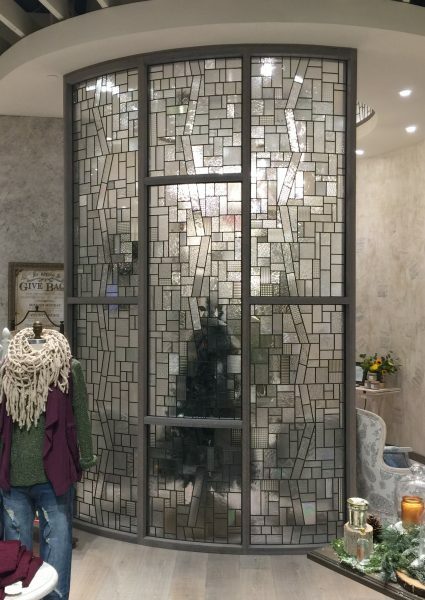 The leaded partition provides privacy for dressing rooms while providing a gorgeous, artist feature that’s contrasted by their custom wallpaper. If you are an architect or designer working on a commercial project or a restaurant owner wanting to create a “wow” factor and help generate repeat business then please give us a call and take advantage of the free advice we can offer you. At Scottish Stained Glass, we provide the best quality stained glass windows, panels, ceilings, and other options to set your business space apart from the others. Contact us today to set up a consultation!